Jose Hidalgo wrote: In that case, could this be done with Rainmeter ? Between midnight and sunrise, use that variable to display the relevant "day" icon for "today"
I'm not completely sure, but it seems that it's not a good idea to get the icon one hour before midnight, because probably on Sunset it disappears. So, right now I'm saying it would good to store the icon provided one hour before Sunset. But this needs further test, which I'll do tomorrow, because today the icon already disappeared. Will come back tomorrow evening. Well, I can confirm that the icon doesn't disappear after sunset, not even hours after the sunset. It only disappears after midnight. I could optimize Time1 and Time2 values until it works perfectly on my setup, and report on the result. I guess Time1 doesn't need to be 1 hour before sunset, but 1 hour before midnight. As for Time2, it probably needs to be 4 AM or so. The "empty icon" problem seems to appear after midnight and until before 4 AM. balala wrote: There are a lot of such skins on both the Share Your Creations section of this forum, or on DeviantArt. You can also try going directly to the Rainmeter Group on Deviant Art. Skins are arranged according to type in different Gallery Folders to help people find what they are looking for. We are still averaging around 10,000 views per day so there must be enough of interest for people to keep on coming back. Jose Hidalgo wrote: Well, I can confirm that the icon doesn't disappear after sunset, not even hours after the sunset. It only disappears after midnight. Ok, these are good news. Jose Hidalgo wrote: I guess Time1 doesn't need to be 1 hour before sunset, but 1 hour before midnight. See that now, in the IfCondition and IfCondition2 options I used the 4 o'clock, as you asked. and add back the MeasureName option to the [MeterIcon2] meter, as it follows: MeasureName=MeasureWeatherIcon2C. Please test the code. How does it work? Hi there Reporting after a few days of testing ! Well, for the moment I'm afraid that there is a bug somewhere, lol. The day names work as expected, but there seems to be something broken with the temperatures, and maybe with the icons too. 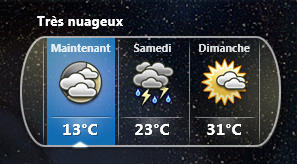 N°1 : Friday, 23h31 : everything seems OK, and 23°C are forecasted for saturday (which is already a big drop from friday's 31°C). But it looks normal due to the forecasted rain. N°2 : Saturday, 03h17 : suddenly the forecast for saturday becomes 12°C, which can only be a "night" forecast ! The temperature can't just drop from 31°C to 12°C by day in less than 24 hours. N°3 : Saturday, 04h49 : suddenly the forecast for sunday has gone from 23°C to 31°C. Weird. Monday forecast at 18°C seems weird too, but that needs to be confirmed (see N°5). 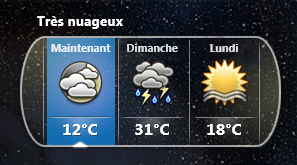 N°6 : Sunday, 15h13 : the forecast for lunday drops from 31°C to 19°C. Weird. Same for tuesday. All week and week-end long, temperatures here have been constant : sunny weather and 30-31°C. So anything in the 12-16-18°C range just can't be right. Except by night of course. At the very first moment, when you refresh the skin, the [MeasureWeatherIcon2] measure (as a matter of fact none of the WebParser measures) doesn't return a value, because these measures need a few seconds to parse the online data. But the [MeasureHour] measure (being a Time measure) is executed immediately after the refresh, so the !SetVariable and !WriteKeyValue bangs used into the IfTrueAction3 option of the [MeasureHour] measure don't set / write the appropriate value for the PrevIcon variable. To make it to set it up properly even so, add a Disabled=1 option to the [MeasureHour] measure and a FinishAction=[!EnableMeasure "MeasureHour"][!UpdateMeasure "MeasureHour"] option to [Today] measure. This option enables and updates the [MeasureHour] measure once the data is parsed by the [Today] measure. Over night the [MeasureWeatherIcon1] measure doesn't return a value, so if we leave the IfTrueAction3 option of the[MeasureHour] measure, the PrevIcon variable remains always empty, which isn't ok at all. So modify the IfTrueAction3 option of the [MeasureHour] measure as it follows: IfTrueAction3=[!SetVariable PrevIcon "[MeasureWeatherIcon2]"][!WriteKeyValue Variables PrevIcon "[MeasureWeatherIcon2]"]. I absolutely appreciate your efforts. I'm even sorry that I dragged you into this ! Weirdly, your last changes don't seem to change anything : the middle rain icon is still there after a refresh, even after a Rainmeter restart. 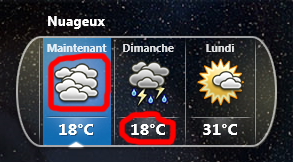 Substitute="Beau":"Beau Temps", "Lgt.Clouds":"Nuages Légers", "Lgt.Fog":"Brouillard Léger", "Lgt.Rain":"Pluie Légère", "Lgt.Snow","Neige Légère", "Heavy Clouds":"Couvert", "Heavy Fog":"Brouillard Epais", "Heavy Rain", "Grosse Pluie", "Heavy Snow":"Grosse Neige", Clouds":"Nuages", "Cloudy":"Nuageux", "Fog":"Brouillard", "Rain":"Pluie", "Thunderstorm":"Orage", "Storm":"Orage", "Snow":"Neige", " And ":" et ", "/":" & "
;Déjà vus : "Beau Temps", "Nuageux", "Très Nuageux"
Jose Hidalgo wrote: Weirdly, your last changes don't seem to change anything : the middle rain icon is still there after a refresh, even after a Rainmeter restart. The issue is caused by the missing PrevIcon variable, left empty. This variable is set / written by the bangs of the IfTrueAction3 option of the [MeasureHour] measure. This option is executed only after 23 o'clock. If you didn't refresh the skin (at least once) between this moment and midnight (and I think you didn't), the variable is left empty and as such the [MeasureWeatherIcon2C] measure encounters an error. There is an extremely simple solution: just add manually any numeric value to the PrevIcon, within the [Variables] section and refresh the skin. Doesn't matter too much what value do you add, important is to be one. After 23, it will be rewritten anyway. So, you can add for example PrevIcon=1. @balala : I understand... but the [Variables] section already has a PrevIcon=32 line ! @xenium : I have taken a look, but that skin has the same problem I'm trying to solve with this one : after midnight we can't see [Today] anymore : we can only see [Now] and [Tomorrow], but not the weather in the morning. I can't believe that nobody has noticed this before, it's a deal-breaker for me, lol.